The sight of the morning sunlight shining through the colorful stained glass, then falling over the tightly woven Persion carpet, is so bewitching that it seems to be from another world. Built by the order from one of the lords of the Qajar Dynasty, Mirza Hasan ‘Ali Nasir al-Mulk, it took 12 years to complete in 1888. Its interior reveals a magnificent masterpiece of design with stunning colours. 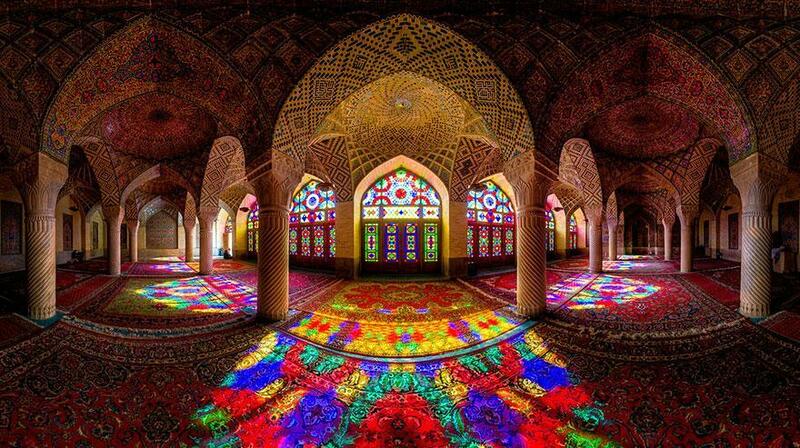 The designers Muhammad Hasan-e-Memar and Muhammad Reza Kashi Paz-e-Shirazi used extensively stained glass on the façade and other traditional elements such as panj kāseh-i (five concaves), which create a breath taking effect of the interior like standing in a kaleidoscope. Once the sunlight hits the stained glass, the entire building is flooded by a vibrant rainbow of colours. In popular culture, the mosque is also called Pink Mosque, because its tiles are beautifully decorated with a pre-eminently pinkish rose colour. Today this gorgeous mosque is still in use under protection by Nasir al Mulk’s Endowment Foundation. Built in late 19th century, not very new and not very old, it is a celebration of both classic and modern times embedded in Islamic heritage. 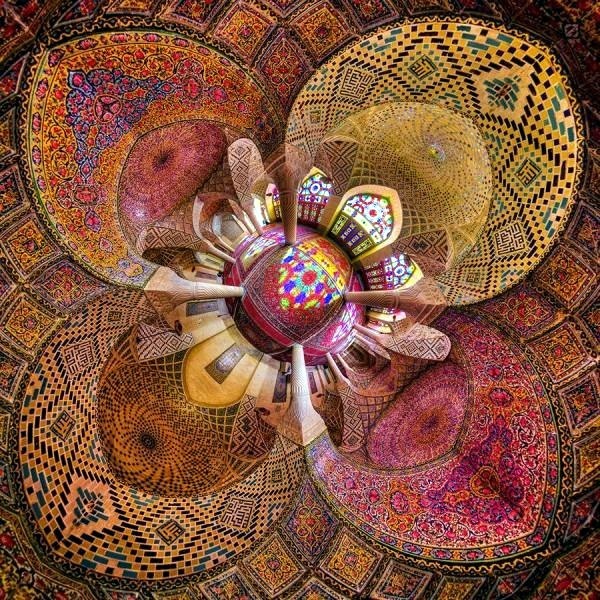 There is a very interesting link with patterns on the mosques and a sophisticated geometry, where art intertwined with science.